3 What is a NAATI translator? 4 What is a NAATI certified translation? 4.1 What types of documents can be translated and certified? 4.2 Why should I have my documents translated by a NAATI translator? 4.3 What is a NAATI stamp? 4.4 What does a certified translation look like? 5 What is the difference between NAATI accreditation and NAATI recognition? 6.1 How much do NAATI certified translation services cost? 7.1 How quickly can a NAATI certified translation be produced? 8.1 What languages does NAATI provide certification in? 8.2 What languages do your translators translate from? 9.1 What is the “new” NAATI Certification system? 9.2 How can I become a certified translator? Looking for a NAATI translator? OPAL Translation are the largest provider of NAATI accredited translators in Australia. Our translators can translate all languages. Prices start at just $69.00 per document. maintain high national standards in translating and interpreting to enable the existence of a pool of accredited translators and interpreters responsive to the changing needs and demography of the Australian community. Basically, NAATI provides accreditation for translators and interpreters in Australia. They are jointly owned by the Federal and state governments and ensures that Australia has a high-standard of language testing for translators and interpreters in an assortment of languages. Fast efficient service. I used the chat line on a Saturday afternoon and a real person responded and helped me with all my questions. The translation was arranged in a matter of an hour and I got a draft on the Monday!!! Would happily recommend this service to anyone needing documents translated.The staff handling the request via email were prompt and very polite. I have not encountered such wonderful service in a long time. They are to be congratulated. Order on last minutes, due to other translater service didn't even bother contact me after send them my documents...started my translation request on Friday then by Tuesday it was all done. including hard copy digital copy.as well as they send hard copy in waterproof plastic sleeve. Their communication and professionalism perfect and re checking of spelling of names. They even email communicated during weekend. (Unlike abobe service who had spelling mistake of client). no wonder they didn't contact me back.I highly recommend EthoLink for any translation of documents. they are champion!! Reliable, accurate and fast services with all the kindnes that goes with it.What more to ask? ''A utiliser les yeux fermés'' as we say in France.Jacques B.
I'm impress for the fast service. I requested a quotation Saturday morning and I got my certificate translated by Monday arvo.Great quality and customer service. I have just recently used the services of Ethnolink to translate some documents from English to Spanish. They were the most affordable company I found. They were quicker than I expected, and very helpful.I will be using them again and would highly recommend them for your translation needs. Second time using translation services from EthnoLink, and I must say that their customer service is above excellent. Definitely recommend them for your translation needs.Keep up the good work! What is a NAATI translator? A NAATI accredited translator is a translator who holds accreditation provided by NAATI. This accreditation is the only standard for translators and interpreters in Australia and is generally required or sought after by employers. Commonly, people call a NAATI accredited translator, a “NAATI translator”. These translators is able to produce what is called a NAATI certified translation. A NAATI certified translation is a translation that has been undertaken by a NAATI accredited or recognised translator. This certified translation is usually accompanied by a “certification statement” at the end of the translation which provides the translator’s name, signature, NAATI number and statement of the NAATI translators belief that they have truthfully and accurately translated the source document into the target language. Certified translations are usually required when submitting documents to authorities such as the Department of Immigration and Border Protection (DIBP) for visa applications, permanent residency applications and for all other official purposes in Australia. What types of documents can be translated and certified? Any document that you need translated into English or vice versa, can be “NAATI Certified” if the translator that holds a current and valid translator credential undertakes the translation and signs the translation (or stamps the translation with their NAATI-issued stamp). Why should I have my documents translated by a NAATI translator? As NAATI is the only body in Australia that provides accreditation of the skills of translators and interpreters, it provides a minimum set of standards that the community can rely on. From a practical perspective, most Government departments and authorities, as well as Universities and professional membership bodies only accept translations that are completed by a NAATI accredited or recognised translator. In many ways, having your documents translated by someone who is a NAATI translator, is the requirement throughout much of Australia. This is their way of knowing that the translation has been completed by someone who has the qualifications to do so and so that they can trust that the translation truthfully and accurately represents the source document. What is a NAATI stamp? 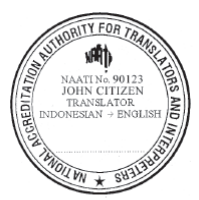 A NAATI stamp is a seal issued to a translator who holds valid and current accreditation. A translator certified by NAATI is able to order a stamp that includes their name and certification details on it, which they can use to produce NAATI certified translations. NAATI does not prescribe a mandatory way of producing a “certified” translation. However, over the years, there have been a number of standards that have emerged within the industry, based on Government departments and their varying requirements for translated documents. Generally speaking, a NAATI certified English translation of a document can be either be a “full” word for word translation or an extract translation. In most cases, an extract translation is suitable as the NAATI certified translator will use their best judgement to ensure that the relevant information from the source document is translated in the translated document. An extract translation is typically used in cases where a full translation is deemed to be unnecessary. For example, some birth certificates in foreign-languages include large passages of legal text that are “overkill” when simply trying to prove one’s birth for an Australian Government authority. NAATI certified translations will typically include the NAATI-issued stamp that indicates the translator’s certification credential (translator or interpreter and at what level), language and direction. A certified translation is typically signed and dated by the translator. Sometimes the translation may also be accompanied by a short “certification statement” from the translator that states that they have truthfully and accurately translated the document to the best of their abilities. It is important to note that these “guidelines” are just that – guidelines. Only the authority that you need to submit the translation to can provide guidance as to what their minimum requirements will be for translated documents. What is the difference between NAATI accreditation and NAATI recognition? On the other hand, NAATI recognition is granted for emerging languages of languages with very low community demand in Australia, where NAATI does not offer accreditation. NAATI recognition is formal acknowledgement of a translator’s regular experience as a translator or interpreter, however it does not define the skill level that that professional has. OPAL Translation is the lowest-cost translation agency providing NAATI certified translation services in Australia. Below we have provided you with a guide that shows you an approximate cost for NAATI translation for the most common documents. How quickly can a NAATI certified translation be produced? Our team of NAATI certified translators are able to produce urgent document translation services for you in as little as 2 hours, sometimes sooner! With Australia’s largest pool of NAATI-certified translators available 24/7, OPAL Translation has access to such a breadth of translators that we are able to service you as fast as humanly possible. Most of our translations are completed within 2-3 business days, but of course, we always do endeavour to translate documents faster than this. If you have a large number of documents, please allow additional time for your translations to be completed. What languages does NAATI provide certification in? What languages do your translators translate from? Our expert team of translators translate all languages that NAATI provides credentialing in and recognition in, including, German, Spanish, French, Italian, Greek, Chinese, Japanese, Malay, Indonesian, Arabic, Portuguese, Polish, Swedish, Norwegian, Hindi, Tamil and Serbian. No matter what language you need translated, our team of accredited translators will be able to assist you – so enquire now to find the right translator for your needs. What is the “new” NAATI Certification system? The NAATI certification system is a newly launched system for translation and interpreting professionals in Australia. It replaces the previous system which was called the NAATI accreditation system. There are many similarities between the two systems, however the main differences can be summarised as there being a more rigorous process to ensure the translation and interpreting professionals are keeping up to date with their work practice and that they are taking part in professional development. Many translators and interpreters who were accredited prior to 2007 had no expiry on their credential and as such, they were not subject to any re-validation (or re-certification under the new system) to ensure that they were keeping current with changes in the translation and interpreting industries. The changes to the NAATI system has had a mixed response from the various stakeholders, however, overwhelmingly, the change has been received positively, particularly by Government authorities who have a vested interest in strengthening requirements and standards in Australia. NAATI has provided some guidance to translators on how they can obtain a certification credential as a translator. This information is available on the NAATI website for translators who are interested in pursuing a career in the translation industry in Australia. Certification can be gained in a number of ways, such as by completing a NAATI approved course or by undertaking a Certification test which includes competency-based testing as well as an ethics component.